LuaLaTeX does not use the correct font shape. Instead of using normal DejaVuSans, ExtraLight shape is embedded into the document. But the correct bold font is used. 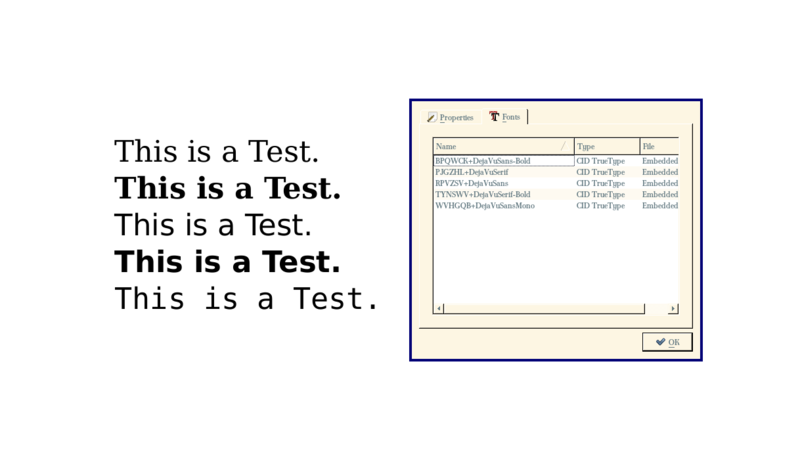 Compiling this document with TexLive 2012, the correct fonts are used. After a reinstallation of TexLive 2013 from a DVD everything worked as expected. Then I updated the luaotfload-package (30701 -> 31286) and the error was there again. This was repeated multiple times (for every dejavu-font on my system, as it seems) and happend every time I run LuaLaTeX. With luaotfload-tool --force --update -v I rebuilt the fonts database and the next run of lualatex was without those forced rebuilds. But sadly, the output is still the same. Okay, the problem was not with TexLive at all. I reinstalled ttf-dejavu (I'm working on an Ubuntu-machine) and now everything works like a charm. Not the answer you're looking for? Browse other questions tagged fonts luatex fontspec or ask your own question. Is direct utf8 input of combining diacritics in math mode possible with lualatex? DejaVu Sans Light with XeLaTeX? How to make contextual substitutions work with luatex 1.0x?